Mormon Apostle LeGrand Richards proclaims: "On the morning of a beautiful spring day in 1820 there occurred one of the most important and momentous events in this world's history. God, the Eternal Father and His Son, Jesus Christ, appeared to Joseph Smith and gave instructions concerning the establishment of the kingdom of God upon the earth in these latter days" (A Marvelous Work and a Wonder, 1966, p. 7). So in accordance with my determination, to ask of God, I retired to the woods to make the attempt. It was on the morning of a beautiful clear day, early in the spring of eighteen hundred and twenty ... I saw a pillar of light exactly over my head.... When the light rested upon me I saw two personages (whose brightness and glory defy all description) standing above me in the air. One Os them spoke unto me, calling me by name, and said, (pointing to the other.) "This is my beloved Son, hear him." ... I asked the personages who stood above me in the light, which of all the sects was right, ... I was answered that I must join none of them, for they were all wrong, and the personage who addressed me said that all their creeds were an abomination in his sight; that those professors were all corrupt.... He again forbade me to join with any of them: and many other things did he say unto me which I cannot write at this time (Times and Seasons, vol. 3, pp. 728, 748). This story is now published in the Pearl of Great Price and is accepted as Scripture by the Mormon people. Apostle John A. Widtsoe said that "the First Vision of 1820 is of first importance in the history of Joseph Smith. Upon its reality rest the truth and value of his subsequent work" (Joseph Smith—Seeker After Truth, p. 19). faithful members give assent. Its importance is second only to belief in the divinity of Jesus of Nazareth. The story is an essential part of the first lesson given by Mormon missionaries to prospective converts, and its acceptance is necessary before baptism" (Dialogue: A Journal of Mormon Thought, Autumn, 1966, p. 29). If something happened that spring morning in 1820, it passed totally unnoticed in Joseph's home town, and apparently did not even fix itself in the minds of members of his own family. The awesome vision he described in later years may have been the elaboration of some half-remembered dream stimulated by the early revival excitement and reinforced by the rich folklore of visions circulating in his neighborhood. Or it may have been sheer invention, created some time after 1834 when the need arose for a magnificent tradition to cancel out the stories of his fortune-telling and money-digging (No Man Knows My History, New York, 1957, pp. 24-25). Dr. Hugh Nibley, of Brigham Young University, was very disturbed by Mrs. Brodie's statements, but he admitted that Joseph Smith did not publish the story until 1842: "Joseph Smith's 'official' account of his first vision and the visits of the angel Moroni was written in 1838 and first published in the Times and Seasons in 1842" (Improvement Era, July 1961, p. 490). Now, it is claimed that "The Father and the Son appeared to the Prophet Joseph Smith before the Church was organized and the priesthood restored to the earth" (Doctrines of Salvation, by Joseph Fielding Smith, vol. 1, p. 4). The revelation given in 1832 suggests that Joseph Smith's story of the first vision was made up years after it was supposed to have occurred. Smith did not even claim to have the Priesthood in 1820, and the Doctrine and Covenants clearly says that without the Priesthood no man can see God and live. James B. Allen, who now serves as assistant church historian, frankly admitted that the story of the first vision "was not given general circulation in the 1830's." (Dialogue: A Journal of Mormon Thought, Autumn 1966, p. 33). Dr. Allen makes some startling concessions in this article. He admits, for instance, that "none of the available contemporary writings about Joseph Smith in the 1830's, none of the publications of the Church in that decade, and no contemporary journal or correspondence yet discovered mentions the story of the first vision...." Dr. Allen goes on to state that in the 1830's "the general membership of the Church knew little, if anything, about it." In the past Mormon apologists have argued that Joseph Smith's first vision was well known from the first time it was announced in 1820. It is refreshing to read James B. Allen's attempt to set the record straight. We were planning to extract a lengthy quotation from Dr. Allen's article, but he refused to give us permission. Those who are interested, however, can read his entire article in Dialogue: A Journal of Mormon Thought, Autumn 1966, pages 29-45. Mormon leaders have maintained that Joseph Smith told only one story concerning his first vision. Preston Nibley asserted that "Joseph Smith lived a little more than twenty-four years after this first vision. During this time he told but one story ..." (Joseph Smith the Prophet, 1944, p. 30). in the Mormon church, told LaMar Petersen that he had examined a "strange" account of the first vision and was told not to reveal what it contained. The following, from notes by LaMar Petersen, recounts the interview with Levi Edgar Young which was held on February 3, 1953: "His curiosity was excited when reading in Roberts' Doc. History reference to 'documents from which these writings were compiled.' Asked to see them. Told to get higher permission. Obtained that permission. Examined the documents. Was told not to copy or tell what they contained. Said it was a 'strange' account of the First Vision. Was put back in vault. Remains unused, unknown." We became interested in the "strange" account and wrote to the church historian for a copy. Our letter was never answered, and we had almost given up hope of ever seeing this document. To our great surprise, however, three "strange" accounts of the first vision have now come to light. The first appeared in the thesis, "An Analysis of the Accounts Relating Joseph Smith's Early Visions," by Paul R. Cheesman. Mr. Cheesman was a student at Brigham Young University who was trying to gather information to support the first vision story. In his zeal, however, Mr. Cheesman brought to light a document which delivers a fatal blow to the official account of the first vision. Not realizing the serious implications of this document, Mr. Cheesman reproduced it as Appendix D of his thesis. 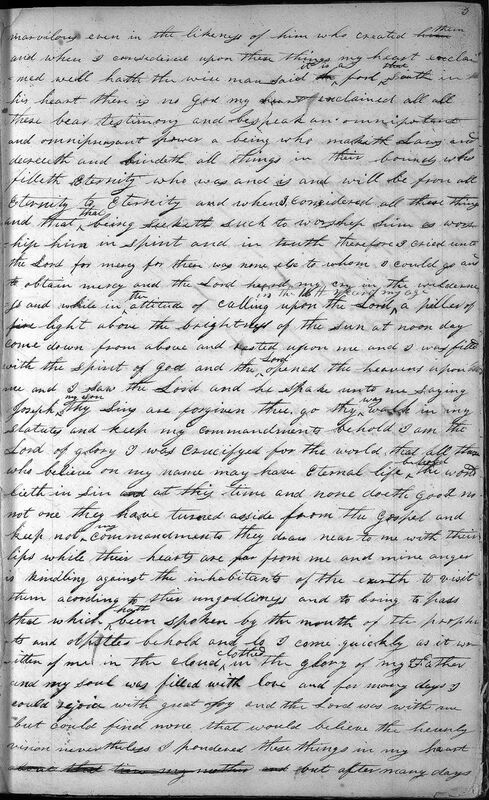 This document, written by Joseph Smith himself, not only makes it evident that he did not see both the Father and the Son in 1820, but also casts a shadow of doubt upon his entire story of the origin of the church. Mr. Cheesman states that it "appears to be the earliest written account" of the first vision. He says that it "was never published or referred to by any of the authorities of the church as far as the writer has been able to determine.... Instead of going back over and revising, Joseph Smith evidently dictated the story later as we have it in Appendix A" ("An Analysis of the Accounts Relating Joseph Smith's Early Visions," M. A. thesis, Brigham Young University, 1965, p. 64). One of the most significant documents of that period yet discovered was brought to light in 1965 by Paul R. Cheesman.... This is a handwritten manuscript apparently composed about 1833 and either written or dictated by Joseph Smith. It ... includes the story of the first vision.... the story varies in some details from the version presently accepted.... The manuscript has apparently lain in the L.D.S. Church Historian's office for many years, and yet few if any who saw it realized its profound historical significance (Dialogue: A Journal of Mormon Thought, Autumn 1966, p. 35). The 1831-32 history transliterated here contains the earliest known account of Joseph Smith's First Vision (Brigham Young University Studies, Spring 1969, pp. 277-78). A closer look at the original document has shown that while Williams wrote the beginning and end of the narrative, Joseph Smith wrote the remainder, including the portion containing the details of his First Vision. This is the only known account of the Vision in his own hand. Most of his writings were dictated, which is not to say that other accounts are less authentic (Dialogue: A Journal of Mormon Thought, Spring 1971, p. 86). 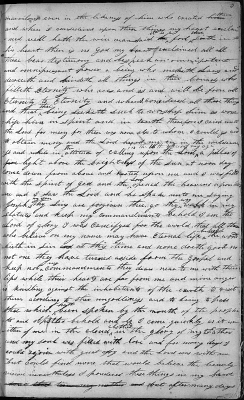 A photograph of Joseph Smith's first handwritten account of the first vision. This is the only account in Smith's own handwriting. A careful examination of this document reveals that the reason church leaders have "never published or referred" to it is that it contains irreconcilable differences with the official account. These differences concern Joseph Smith's age, his reason for seeking the Lord, the question of a revival, and the presence of an evil power (see Mormonism—Shadow or Reality? p. 146). The most serious contradiction between the accounts is the number of personages in the vision. In the first account Joseph Smith only mentions one personage: "... I saw the Lord...." In the version published today in the Pearl of Great Price, Joseph Smith said: "... I saw two personages." In the account that was suppressed by Mormon leaders, Joseph Smith related that the Lord said he was "crucifyed for the world." This, of course, would mean that the personage had to be Jesus Christ. Therefore, it is plain to see that Joseph Smith did not include God the Father in his first account of the vision. James B. Allen stated: "In this story, only one personage was mentioned, and this was obviously the Son, for he spoke of having been crucified" (Dialogue: A Journal of Mormon Thought, Autumn 1966, p. 40). Paul R. Cheesman tries to excuse the fact that the account which was suppressed only mentions one personage by stating: "As he writes briefly of the vision, he does not mention the Father as being present; however, this does not indicate that he was not present" ("An Analysis of the Accounts Relating Joseph Smith's Early Visions," p. 63). This explanation by Paul Cheesman does not seem reasonable. Actually, in this first account, Joseph Smith quotes the Lord as saying more words than in his later printed version. account, Joseph recognized the desirability of modifying certain statements.... Often when people record biographical sketches or historical incidents, they write and rewrite until their ideas are clearly expressed" (Joseph Smith's First Vision, 1971, p. 124). While it is true that many people have to "write and rewrite until their ideas are clearly expressed," we do not feel that Joseph Smith could have left out the most important part of the story by accident. If God the Father had actually appeared in this vision, Joseph Smith certainly would have included this information in his first account. It is absolutely impossible for us to believe that Joseph Smith would not have mentioned the Father if He had actually appeared. The reader will notice how the wording is changed to support the idea of two personages. In the first account Joseph Smith says that "the Lord ... spake unto me saying Joseph my son thy sins are forgiven thee." The later version also uses the word son, but this time it no longer refers to Joseph Smith but rather to another personage in the vision: "One of them spoke unto me, calling me by name, and said, (pointing to the other.) 'This is my beloved Son, hear him.'" We feel that the only reasonable explanation for the Father not being mentioned in the account which was suppressed is that Joseph Smith did not see God the Father, and that he made up this part of the story after the writing of the first manuscript. This, of course, throws a shadow of doubt upon the whole story. consumed, another personage soon appeared like unto the first, he said unto me thy sins are forgiven thee, he testifyed [sic] unto me that Jesus Christ is the Son of God; and I saw many angels in this vision I was about 14 years old when I received this first communication ... (Joseph Smith's Diary, 1835-36, p. 24, as quoted in Dialogue: A Journal of Mormon Thought, Spring 1971, p. 87). The reader will notice that in this account of the first vision there is absolutely nothing to show that the personages were God and Christ. The statement, "He testifyed unto me that Jesus Christ is the Son of God," would seem to show that the personages were not the Father and the Son. If Joseph Smith had intended to show that the personage who spoke was Jesus, he should have said something like this: "He testified also unto me that He was the Son of God." On the other hand, if he intended to show that the personage who spoke was the Father, he would probably have said something like this: "He testified also unto me that Jesus Christ was His son." Adding to the confusion, Joseph Smith states that there were "many angels in this vision." Neither of the other versions indicate that there were "many angels." It is also interesting to note that Joseph Smith's 1835-36 diary was used as a basis for much of his History of the Church for that period, but the portion containing this confusing account of the first vision was omitted. We have now examined three different handwritten manuscripts of the first vision. They were all written by Joseph Smith or his scribes and yet every one of them is different. The first account says there was only one personage. The second account says there were many, and the third says there were two. The church, of course, accepts the version which contains two personages. If we had to accept any of the versions, we would chose the first account. It was written six or seven years closer to the event, and therefore it should give a more accurate picture of what really took place. Also, this account, which mentions only one personage, is the only account in Joseph Smith's own handwriting. At any rate, when one becomes aware of the fact that there are conflicting versions of the story, it becomes very difficult to believe that Joseph Smith ever had a vision in the grove. Under the date of November 15, 1835 in the History of the Church appears the following statement by Joseph Smith: "I gave him [Erastus Holmes] a brief relation of my experience while in my juvenile years, say from six years old up to the time I received my first vision, which was when I was about fourteen years old ..." (Vol. 11, p. 312). But Joseph admittedly did not begin writing his history until 1838, and the editors of this history do not state from which manuscript source in the Utah Church library this journal entry came. Access to all these important manuscripts is denied everyone save authorities of the Mormon Church (No Man Knows My History, p. 24, footnote). In 1835 he told one Erastus Holmes of his "First Vision which was when I was fourteen years old." ... The proponents of the theory that the Prophet invented the First Vision in 1838 doubt the accuracy of the Holmes and similar references, because they hold that the Church History, the journal of Joseph Smith, has been tampered with by later workers. It is sad when a drowning man does not even have a straw to which he may cling!" (Joseph Smith—Seeker After Truth, pp. 24-25). This afternoon, Erastus Holmes, of Newbury, Ohio, called on me to inquire about the establishment of the church, and to be instructed in doctrine more perfectly. I gave him a brief relation of my experience while in my juvenile years, say from six years old up to the time I received the first visitation of angels, which was when I was about fourteen years old; also the revelations that I received afterwards concerning the Book of Mormon, and a short account of the rise and progress of the church up to this date (Deseret News, vol. 2, no. 15, May 29, 1852). A photograph of the Deseret News, May 29, 1852. Notice that Joseph Smith stated that "angels" appeared to him in the first vision. The word "angels" had been removed in recent editions of the History of the Church. "... I received the first visitation of angels, which was when I was about fourteen years old ..." (May 29, 1852). "... I received my first vision, which was when I was about fourteen years old ..." (vol. 2, p. 312). The original handwritten manuscript for this part of Joseph Smith's History reads exactly like the Deseret News: "... I received the first visitation of angels ..." (Manuscript History, Book B-1, p. 642). In addition to this, Joseph Smith's 1835-36 diary, page 37, provides supporting evidence for the word "angels": "... I received the first visitation of angels..."
The fact that Mormon historians had to make such a serious change in Joseph Smith's History after his death tends further to weaken the case for the first vision. The Mormon writer Paul R. Cheesman says that "Joseph Smith's account is unique in that the Father and the Son appeared together and they both spoke. To those who accept the Bible and the Book of Mormon as authentic, nowhere in these histories do we have another example that parallels this experience in this respect" ("An Analysis of the Accounts Relating Joseph Smith's Early Visions," p. 18). Now that we have Joseph Smith's first account of his vision, which only mentions Christ as appearing, we know that his claim was not unique. Many people were making similar claims. For instance, in 1816 a minister by the name of Elias Smith published a book in which he told of his conversion. Notice how similar it is to Joseph Smith's first account: "... I went into the woods ... a light appeared from heaven.... My mind seemed to rise in that light to the throne of God and the Lamb.... The Lamb once slain appeared to my understanding, and while viewing him, I felt such love to him as I never felt to any thing earthly.... It is not possible for me to tell how long I remained in that situation ..." (The Life, Conversion, Preaching, Travels, and Sufferings of Elias Smith, Portsmouth, N.H., 1816, pp. 58-59). 'Thy sins be forgiven thee.' A third saw his Savior descending to the tops of the trees at noon day" (The Christian Baptist, Vol. 1, pp. 148-49). Asa Wild claimed to have a revelation which is very similar to the story Joseph Smith published. It was published in the Wayne Sentinel (the paper to which the family of Joseph Smith apparently subscribed) on October 22, 1823: "It seemed as if my mind ... was struck motionless, as well as into nothing, before the awful and glorious majesty of the Great Jehovah. He then spake ... He also told me, that every denomination of professing christians had become extremely corrupt...."
It is plain to see, then, that the story Joseph Smith penned in the early 1830s is not much different than the visions related by others. It was only when he added the part about the Father appearing with the Son that the story began to sound unique. The first published consecutive account of the origin of the Church began in the October, 1834, issue of the Messenger and Advocate. It consists of eight letters written by Oliver Cowdery to W. W. Phelps. This account is very important as Oliver Cowdery claims in a letter published in the October, 1834, issue, but dated September 7, 1834, that Joseph Smith assisted him in the writing of the letters. On the evening of the 21st of September, 1823, previous to retiring to rest, our brother's mind was unusually wrought up on the subject which had so long agitated his mind—his heart was drawn out in fervent prayer.... While continuing in prayer for a manifestation ... on a sudden a light like that of day, ... burst into the room.—... and in a moment a personage stood before him ... he heard him declare himself to be a messenger sent by commandment of the Lord, to deliver a special message, and to witness to him that his sins were forgiven ... (Messenger and Advocate, vol. 1, pp. 78-79). Several things should be noted concerning this history: first, that it was supposed to be a "correct" account; second, that Joseph Smith assisted in the writing; third, that the date of the religious excitement in Palmyra was 1823; fourth, that Joseph Smith desired to know at this time "if a Supreme being did exist"; fifth, that a "messenger sent by commandment of the Lord" appeared to him and told him that his sins were forgiven. If the reader examines this account carefully, he will see that it is absolutely impossible to reconcile it with Joseph Smith's later story that he saw the Father and the Son in 1820. Prior to the time Paul Cheesman wrote his thesis at Brigham Young University, Mormon writers were emphatically proclaiming that Joseph Smith "told but one story" of the first vision. Now that the "strange" accounts of the first vision have been printed and widely circulated, Mormon apologists are forced to admit their existence and authenticity. They will not, however, face the serious implications of the differences in the accounts. Dr. Truman G. Madsen, of Brigham Young University, even goes so far as to say that "we are impressed with their harmony considering the very different circumstances of their writing..." (Brigham Young University Studies, Spring 1969, p. 240). not concerned really with which of the two Versions of the First Vision is right.... Personally I would take the version which the Prophet Joseph gave himself when he stated that he saw two personages. Regardless whether he saw one or two the fact remains that Jesus Christ is mentioned in both of them." There was no man scarcely upon the earth that had a true conception of God.... But all this was swept away in one moment by the appearance of ... God, the Father, and His Son Jesus Christ, to the boy Joseph.... The Father came accompanied by the Son, thus showing that there were two personages of the God-head ... Joseph saw that the Father had a form; that He had a head; that He had arms; that He had limbs; that he had feet; that He had a face and a tongue ..." (Journal of Discourses, vol. 24, pp. 371-72). Apostle LeGrand Richards states: "This was the prophet's first vision. From this we learn among other truths, that God the Father and his Son, Jesus Christ, are separate and distinct personages, and that man is literally created in the image of God" (A Marvelous Work And A Wonder, 1966, p. 12). Tenth president, Joseph Fielding Smith said that "there is no account in history or revelation extant, where ever before both the Father and the Son appeared in the presence of mortal man in glory" (Essentials in Church History, pp. 46-47). Apostle John A. Widtsoe stated: "It was an extraordinary experience. Never before had God the Father and God the Son appeared to mortal man" (Joseph Smith—Seeker After Truth, p. 4). flesh to the will of the Father, being the Father and the Son.... And thus the flesh becoming subject to the Spirit, or the Son to the Father, being one God ... (Book of Mormon, Mosiah 15:1, 2, 5). The Book of Mormon tells of a visitation of the Father and the Son to the "brother of Jared." The Father and the Son mentioned, however, are not two separate personages. Only one personage appears, and this personage says: "Behold, I am he who was prepared from the foundation of the world to redeem my people. Behold I am Jesus Christ. I am the Father and the Son. In me shall all mankind have light ..." (Ether 3:14). The Book of Mormon clearly teaches that God the Father is a Spirit, and the first edition of the Doctrine and Covenants also contained a reference which stated that God is a Spirit. Brodie's assumption of a deceitful prophet was supported by her discovery that early Mormons did not relate the first vision story consistently, and, as she maintained in 1945, the earliest version by the prophet was not written until 1838. She has had to revise the argument somewhat since it is now known that the earliest account extant was written in 1832. But there are, undeniably differences in the several accounts, not all of them minor from the standpoint of Mormon theology ... To focus upon the discrepancies touching the personages of the Godhead in the first vision story whether one or two personages, is to concentrate on a theological question and to miss its historical significance.... Brodie and others have been preoccupied with the first vision's theological implications which were the product of Joseph Smith's and the Mormon people's later thinking. This has caused them to miss the important implications as to the social and religious origins of Mormonism which may be the essential point. If over the years Joseph's conception of the Godhead changed, this is not evidence of fraud any more than the adaptation of other aspects of his theology in later years proves to be (Dialogue: A Journal of Mormon Thought, Winter 1972, pp. 78-79). Anti-Mormon writers have pointed out that after Joseph Smith's death the Mormon leaders made some very confusing statements concerning the first vision. Now that we have Joseph Smith's first written accounts of the vision we are able to understand why they were in such a state of confusion. Wesley P. Walters states: "... the shift from an angel to Christ, then to angels, and finally to two personages introduced such haziness that even the Mormon leaders appeared confused as to the nature of the story itself" (Dialogue: A Journal of Mormon Thought, Spring 1969, p. 73). But as it was in the days of our Savior, so was it in the advent of this new dispensation. It was not in accordance with the notions, traditions, and pre-conceived ideas of the American people. The messenger did not come to an eminent divine of any of the so-called orthodoxy, he did not adopt their interpretations of the Holy Scriptures. The Lord did not come with the armies of heaven, in power and great glory, nor send His messengers panoplied with aught else than the truth of heaven, to communicate to the meek, the lowly, and the youth of humble origin, the sincere enquirer after the knowledge of God. But He did send His angel to this same obscure person, Joseph Smith jun., who afterwards became a Prophet, Seer, and Revelator, and informed him that he should not join any of the religious sects of the day, for they were all wrong ... (Journal of Discourses, vol. 2, p. 171). John Taylor, the third president of the church, made the following statement on March 2, 1879: "... just as it was when the Prophet Joseph asked the angel which of the sects was right that he might join it. The answer was that none of them are right. What, none of them? No. We will not stop to argue that question; the angel merely told him to join none of them that none of them were right" (Journal of Discourses, vol. 20, p. 167). When Joseph Smith was about fourteen or fifteen years old, ... there was a revival of religion ... He had read the Bible and had found that passage in James.... he went humbly before the Lord and inquired of Him, and the Lord answered his prayer, and revealed to Joseph, by the ministration of angels, the true condition of the religious world. When the holy angel appeared, Joseph inquired which of all these denominations was right and which he should join, and was told they were all wrong ... (Journal of Discourses, vol. 12, pp. 333-34). A photograph of the Journal of Discourses, vol. 2, page 171. Brigham Young says that "the Lord did not come" to Joseph Smith in the first vision, but instead sent "sent his angel." Many other confusing statements about the first vision were made by Mormon leaders after Joseph Smith's death. Today the first vision has become of such importance that a person must believe it to be considered a good Mormon. David O. McKay, the ninth president of the church, stated that the first vision is the very "foundation of this Church" (Gospel Ideals, p. 85). In his thesis (p. 75), Paul R. Cheesman stated that the Mormon church "must stand or fall on the authenticity of the First Vision and the appearance of the Angel Moroni." Apostle Widtsoe stated: "The story of the First Vision need only be studied from original sources to assure the seeker not only of its truth, but also of the time of its occurrence" (Joseph Smith—Seeker After Truth, p. 26). When we examine the original sources, especially the sources suppressed by the Mormon leaders for over 130 years, we find that the first vision story rests on a very sandy foundation. Dr. Hugh Nibley once criticized anti-Mormon writers for omitting the "all-important" words, "This is my beloved Son," when giving Joseph Smith's story. If Dr. Nibley had read Joseph Smith's first handwritten account of the vision, perhaps he would not have been so eager to criticize, for Joseph Smith not only omitted the "all-important" words, but he also left God the Father completely out of the vision! The second account by Joseph Smith also did not contain the "all- important" words; in fact, it contained words which seem to show that it was not the Father and the Son. An examination of the first published history of the church makes matters even worse, for it does not even mention the first vision. Moreover, Oliver Cowdery claimed that in 1823 Joseph Smith did not even know "if a Supreme being did exist." Certainly, if Joseph Smith had seen the Father and the Son in 1820, as the official account proclaims, he would know in 1823 that a Supreme Being did exist! Besides all this, falsification has been found in the History of the Church. Joseph Smith told Erastus Holmes about his "first visitation of angels," but later Mormon historians altered this to read: "my first vision." It is very difficult to believe in the authenticity of Joseph Smith's first vision story when there is so much evidence against it. During this time of great excitement my mind was called up to serious reflection.... So in accordance with this my determination, to ask of God, I retired to the woods to make the attempt. It was on the morning of a beautiful clear day, early in the spring of eighteen hundred and twenty (Times and Seasons, vol. 3, pp. 727-28). Information which we have recently uncovered conclusively proves that the revival did not occur until the fall of 1824 and that no revival occurred between 1819 and 1823 in the Palmyra vicinity. When we turn to the year 1820, however, the 'great multitudes' are conspicuously missing. The Presbyterian Church in Palmyra certainly experienced no awakening that year. Rev. James Hotchkin's history records revivals for that church as occurring in the years 1817, 1824, 1829, etc., but nothing for the year 1820. The records of Presbytery and Synod give the same picture.... Since these reports always rejoice at any sign of a revival in the churches, it is inconceivable that a great awakening had occurred in their Palmyra congregation and gone completely unnoticed. The Methodist figures, though referring to the entire circuit, give the same results, for they show net losses of 23 for 1819, 6 for 1820 and 40 for 1821. This hardly fits Joseph Smith's description of 'great multitudes' being added to the churches of the area. In fact, the Mormon Prophet could hardly have picked a poorer year in which to place his revival, so far as the Methodists were concerned. the article referred to above. Milton Backman, however, has discovered interesting new material which he presents in his important article on the historical setting of the First Vision (Brigham Young University Studies, Spring 1969, p. 272). Mr. Walters' main argument is that no revival occurred in Palmyra itself. But even that fact cannot be established absolutely. It is a negative claim and depends on negative evidence, which is always tenuous. Mr. Walters relies on the absence of revival reports, but just because someone failed to write a report of an event does not mean it did not occur.... lots of things happen that are never recorded.... The news included in the Palmyra paper depended on the taste and inclinations of the editor.... The point is that although we think a revival should have been recorded, there are many reasons why it could have been missed. We cannot know for sure that an event did not occur unless reliable witnesses on the scene say no, and thus far Mr. Walters has found none such to testify (Dialogue: A Journal of Mormon Thought, Spring 1969, p. 87). for this massive silence is that no revival occurred in the Palmyra area in 1820 (Dialogue, Spring 1969, p. 67). Now let me ask you a question. Where was the revival? In Palmyra? He doesn't mention a revival at all. He mentions an unusual excietment [sic] in the "Whole district of country." Could an excietment [sic] be caused by a revival somewhere near the area? He doesn't mention being to a revival. If there was a revival somewhere outside of Palmyra and the news of it had already excited the village, would or could it be possible that the Smith family have travelled there to sell root beer and cakes? (Letter from Lauritz G. Petersen, dated November 1, 1968). Although it is true that Joseph Smith does not use the word "Palmyra," his description makes it very clear that he was referring to this area. He states that there "was in the place where we lived an unusual excitement on the subject of religion" (History of the Church, vol. 1, p. 2). In 1843 Joseph Smith told a reporter that this excitement occurred right "in the neighborhood where I lived ..." (New York Spectator, Sept. 23, 1843, as cited in Joseph Smith the Prophet, by Preston Nibley, pp. 30-31). The Mormon historian B. H. Roberts definitely stated that the revival was in "Palmyra" (Comprehensive History of the Church, vol.1, p. 35). On page 51 of the same volume Mr. Roberts claims that the "churches in and about Palmyra decided upon a 'union revival,' in order to 'convert the unconverted.' "
Since Mormon apologists have been unable to prove that the revival took place in Palmyra, they have tried to find reasons why Joseph Smith would have been in another city. Milton V. Backman, Jr., and other Mormon writers have suggested that Joseph Smith might have been present at conference meetings held in Vienna (now known as Phelps). Wesley Walters, however, answered this argument in Dialogue: A Journal of Mormon Thought, Spring 1969, page 69. 1820" (Joseph Smith the Prophet, p. 21). We have checked the references which Preston Nibley gives and find them to be spurious (see Mormonism—Shadow or Reality? p. 160). Mr. Nibley gives two references from a publication that are supposed to refer to the 1820 revival. We have found, however, that these references do not refer to a revival in 1820, but rather to one in the years 1824-25. These references have been found in the Wayne Sentinel under the date of March 2, 1825. Apostle Gordon B. Hinckley continues to use these spurious references in his book Truth Restored. He seems to be oblivious to the fact that the church's own research team has failed to verify them. It would appear, then, that all evidence for a revival in Palmyra and vicinity has fallen, and that Wesley P. Walters's work has been vindicated. All that the Mormon research team has been able to do is to confirm his original findings. Mr. Walters made this interesting observation: "Joseph made his great mistake when he tried to alter the course of history by moving a whole revival back some 4 years. This defect places his entire movement upon a crumbling foundation."